A quick craft to test the new ‘Deploy Shielded’ tweakable on landing gear & legs. Half of the gear/legs have it enabled, the other disabled. All of them are well inside the fairing.¨¨Before launch: test gear and watch it all extend and retract without problem. Expected: only the half with Deploy Shielded should extend.¨After launch: test gear again once airborn. Now the gear that is set ‘disabled’ give the dreaded cannot deploy while stowed message, even though before they worked. But the legs all still work. Expected: consistency….¨¨btw: the lights on the two largest gear auto-disable when retracting, but on’t auto-enable again when extending. Also inconsistent with smallest two gear, which stay on unless explicitly disabled. A stock rocket called TestDeployShielded00. Built with 37 of the finest parts, its root part is probeStackLarge. 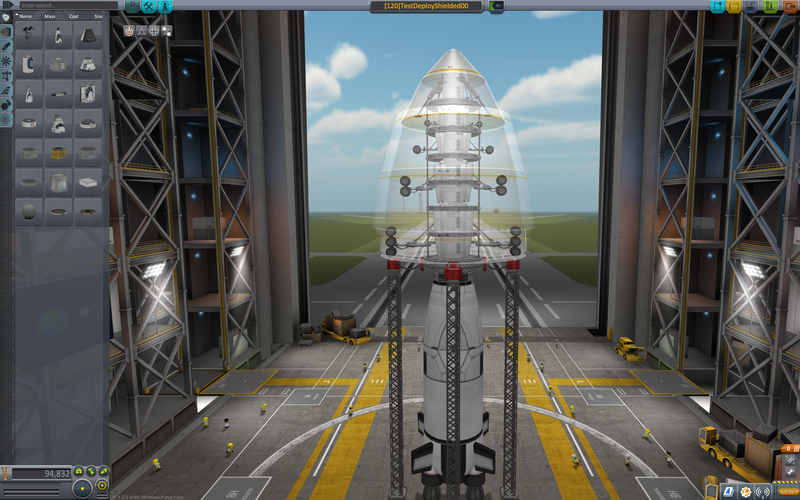 Built in the VAB in KSP version 1.2.0. Don’t take anything too seriously, I’m mostly just having crazy fun testing the (im)possibilities of flight, physics and design in the amazing sandbox that is Kerbal Space Program. Feedback is welcome!